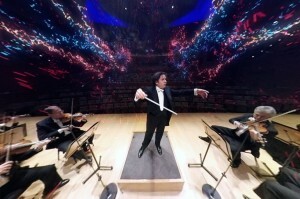 Ready for Beethoven’s Fifth…in virtual reality? Today and tomorrow, VAN Beethoven, a free, unprecedented classical music experience comes to Levitt Pasadena and Levitt Los Angeles as a part of the Los Angeles Philharmonic’s Immortal Beethoven Festival. Using virtual reality headsets, “concertgoers” will experience the opening minutes of Beethoven’s famous symphony as if seated in the Walt Disney Concert Hall—without ever leaving the VAN Beethoven truck. 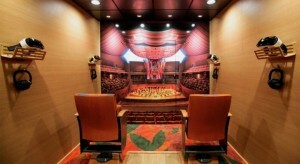 In the plush VAN Beethoven truck, visitors are greeted with carpet and seating from the Walt Disney Concert Hall. Donning their Samsung Gear VR headsets, they enter the immersive stereoscopic, 360-degree, 3D environment, created using footage from 14 different cameras. Inside the VAN Beethoven truck. Photo courtesy of the LA Phil. As visitors move around, their viewing angle shifts with them, and the audio—recorded using 40 microphones—subtly changes as if viewers were at a live performance. The hall is empty, treating the viewer to an intimate private concert close to conductor Gustavo Dudamel and the rest of the orchestra. The four-minute experience, produced by interactive agency Secret Location with support by a grant from The James Irvine Foundation, also incorporates colorful bursts of computer-generated graphics visually representing the dynamics of the famous composition. What makes this project remarkable? Gustavo Dudamel conducting the VAN Beethoven experience. Photo courtesy of the LA Phil. Reflecting conductor Gustavo Dudamel’s passion for bringing the arts to underserved communities, VAN Beethoven makes it possible for people who may not otherwise have access to the LA Phil to experience one of their concerts for free. In addition to Levitt Pasadena and Levitt Los Angeles, the mobile tour will also stop at Grand Park, LA Korean Festival, Downtown Artwalk, CicLAvia and other parks, cultural festivals, museums and outdoor spaces in the greater Los Angeles area through October 18. Be sure to check out the VAN Beethoven mobile tour when it stops at Levitt Pasadena tonight from 6–9 p.m. and at Levitt Los Angeles tomorrow from 4–8 p.m.! And if you don’t live in southern California, the experience will also be available as a free app called Orchestra VR in the Oculus Rift and Samsung VR app stores. Please note that this technology has been approved for use by people 13 or older without a history of epilepsy, seizures or convulsions. The truck is wheelchair accessible. Any user under the age of 18 (minor) will require a parent to complete a waiver in order to take part in the experience. This entry was posted in Arts Access, Beyond Levitt and tagged Levitt Los Angeles, Levitt Pasadena, Los Angeles Philharmonic, VAN Beethoven on September 18, 2015 by Katie Huang.